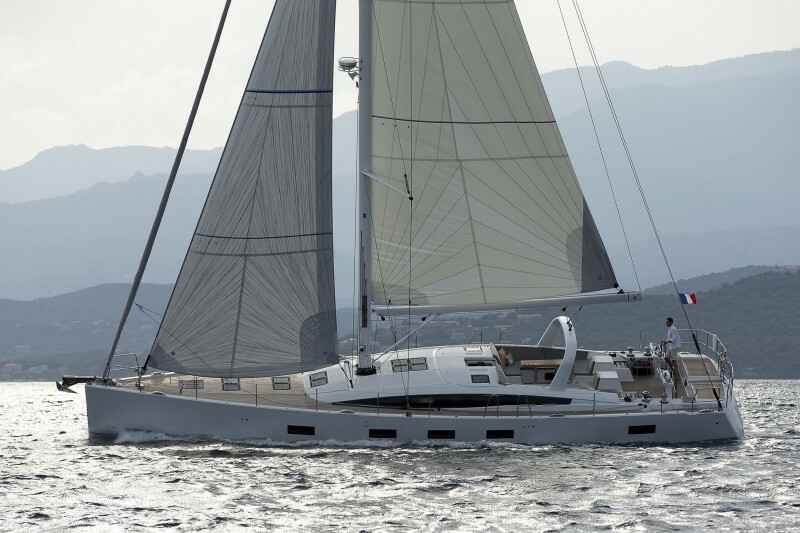 The Jeanneau 64 is a yacht nipping at the heels of superyacht territory. More than a few jaws dropped at the Annapolis boat show when Jeanneau introduced their latest flagship, a new 64-footer that's edging up into yacht territory in size, but in terms of features and luxury, seems almost like a superyacht. A Phillippe Briand design, the Jeanneau 64 was years in the making and although generously proportioned, she can still be sailed without professional crew—as well as hitting a few aspirational notes. 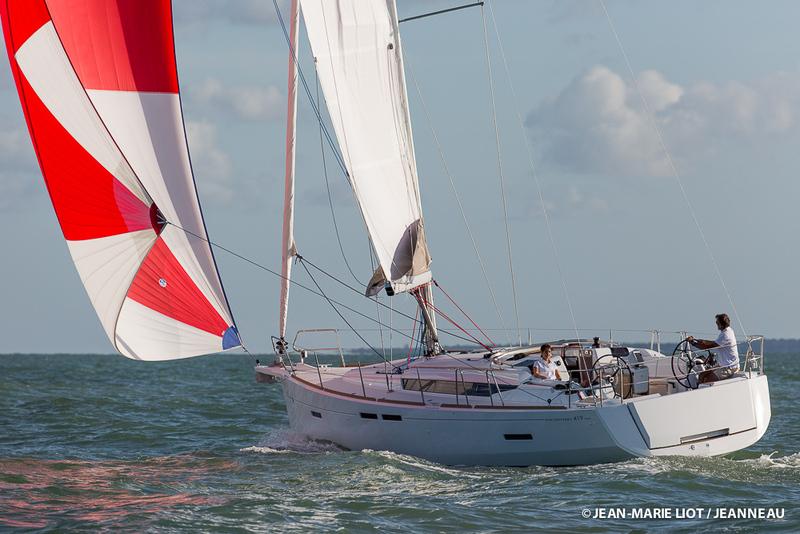 The Jeanneau 64 stole the spotlight at the 2015 Annapolis sailboat show. I boarded the 64 at the swim platform, and peered into the garage where a dinghy is housed athwartships. 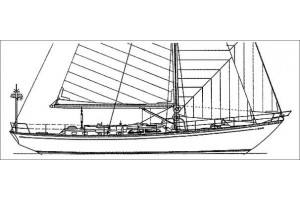 When lowered, the transom provides a way to load that dinghy or enjoy the teak beach. From here, the level of the deck was not quite above my head. I used the ladder to ascend to the cockpit, which makes up 40 percent of the deck area aboard. 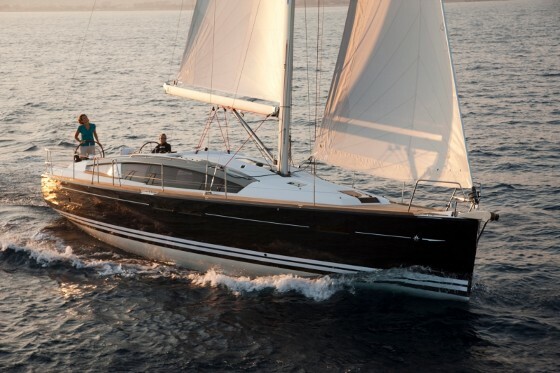 On deck, the Jeanneau 64 is eight feet longer than the previous flagship and it shows. Twin aft sunpads rest behind the two wheels and a grill pops up from beneath the starboard pad. A sink and refrigerator are also on deck to complete an outdoor galley. Step forward to the lounging cockpit, where two tables will easily seat eight for an al fresco dinner. Or, lower on telescoping legs to form two more giant sunpads complete with cupholders. This is such an elegant setup, it makes you want to dress for dinner. All lines are led aft and are within reach of the helms, which means that with the self-tacking staysail on a track just ahead of the mast, it’s possible to single-hand this yacht. With the 105% genoa, the sail area is over 2,000 square feet and that’s not counting the giant asymmetrical that can be added on a furler. The mainsheet attaches to the overhead arch and keeps the cockpit mostly free of clutter. Four winches and two arrays of line clutches manage most of the lines aboard and none of them are on the coachroof at the companionway, as on many boats. Both helms have massive three-foot-wide consoles to hold multifunction displays as well as engine and thruster controls. Superyacht designer Andrew Winch was invited to create the interior of the Jeanneau 64. With its hard chine and nearly 18’ beam, the model offered oodles of room inside for him to work with. 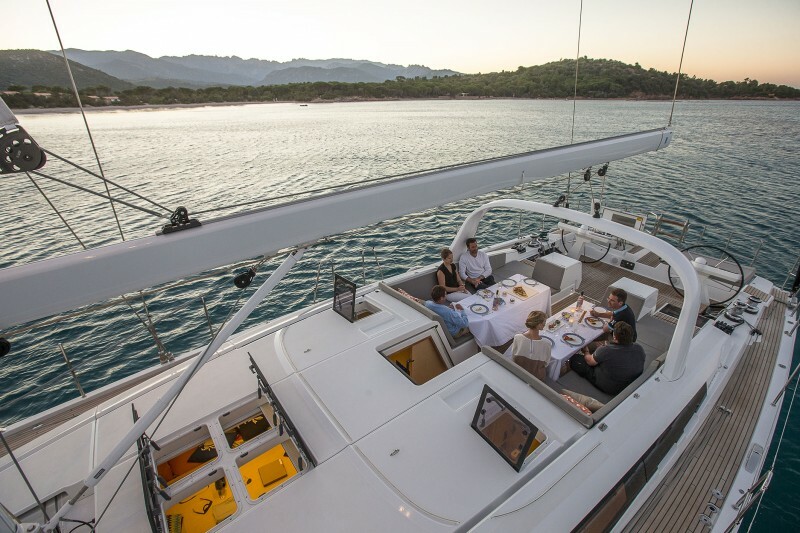 Jeanneau also focused on choices to make the 64 feel like a semi-custom yacht and besides the usual wood, fabric and finish options, there are up to six different layouts available. The basics come down to this: the master suite can be either forward or aft. When aft, the stateroom has a centerline berth, a vanity desk, a seat to port, and a loveseat-style settee to starboard. A large head with a separate shower stall is also to starboard. Two large, curved opening hatches lead to the cockpit and bring in air and light. This arrangement leaves room for two Pullman-style double cabins forward with heads and shower stalls in the bow. When forward, the master has a large berth offset to starboard with the head of the bed toward the stern. You can still walk around the berth. A settee with an aft-facing desk is to port and the single head with separate shower stall is in the bow. This leaves room for two cabins aft, one with a double berth to starboard that has an ensuite head and one with two singles to port separated by a ladder, which provides egress to the cockpit above. This cabin will be great for kids or crew and it uses the day-head aft of the galley, to port. There’s also the choice of just having two masters, one forward and one aft, for two couples wanting the most privacy possible. 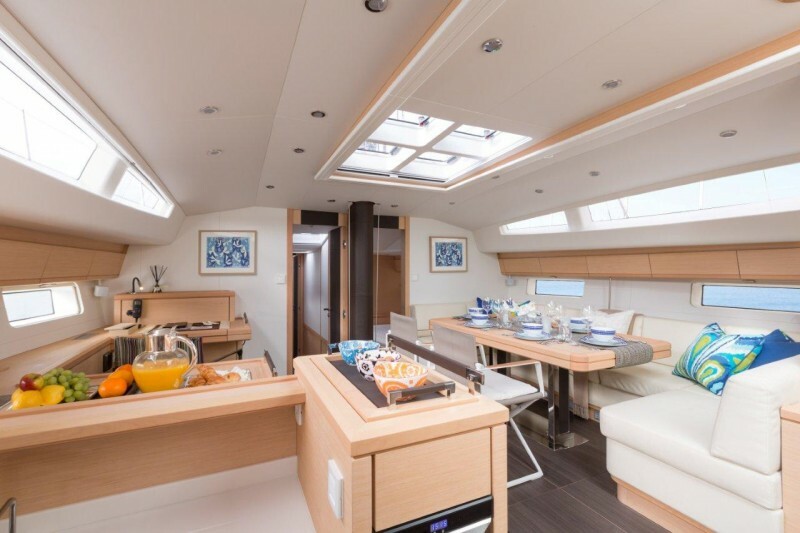 Two living elements are fixed in the Jeanneau 64 interior: the galley and the saloon dinette. The L-shaped galley is to port and one step down from the main interior deck. It has a stacked refrigerator and freezer, a three-burner glass-topped gimbaled stove and oven, twin sinks, a tall wine cooler, acres of countertop space, and ample lockers for stowage. The U-shaped dinette ahead to starboard can seat six comfortably, or eight in a squeeze. Beyond these fixed areas, choices abound. One option is either a midships over/under cabin (again for guests or crew) or a full navigation station to starboard aft of the dinette. When the side cabin is chosen, the nav desk moves forward to port across from the dinette. Alternately, that area can also becomes a large settee that’s really a huge daybed lounge. Everything about the interior says contemporary chic. This is not a traditional yacht in any sense; rather, there is a light wood finish, large windows, leather accents and pull handles, chrome fixtures, soft and indirect lighting, and padded surfaces. It resembles a modern Los Angeles or Miami condominium—and is sized like one, too. The Jeanneau 64 is powered by a 180 HP Volvo Penta D4 diesel. It’s one of the things that is not changeable about the model, not that it needs to be since it has plenty of power to push this boat. The diesel sits in an engine room that’s nearly a walk-in. Twin thrusters are available and after looking forward from the wheels the length of the boat, I’d feel better having that assistance when docking. A workshop is available in one of the layouts, in lieu of a cabin. 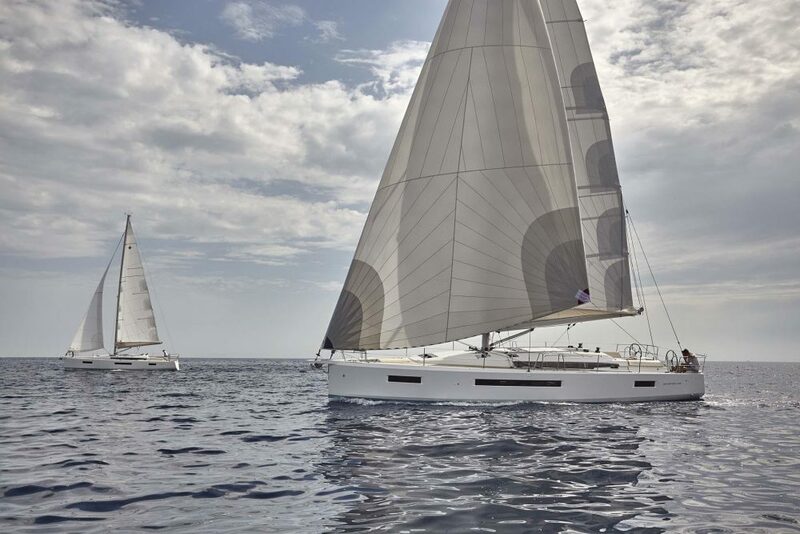 Although not inexpensive by any standards, at just under $1 million for a base boat (add another 40 percent for all the bells and whistles), the Jeanneau 64 is a bargain by competitive standards and Jeanneau has already sold over a dozen hulls. They hope to attract Jeanneau owners stepping up from 50-something footers and it’s likely they will meet that goal before year end. Jeanneau positioned the boat at an angle at the Annapolis docks, and shined a giant spotlight on her in the evenings. The effect was the talk of the show, as people lined up to board and see what it’s like when a superyacht-ish boat is created for we mere mortals. 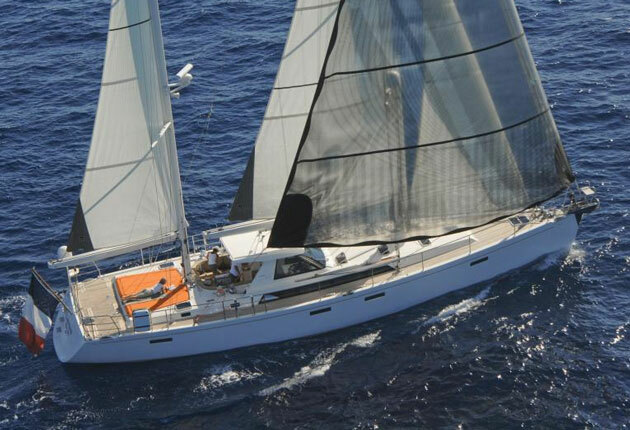 Other Choices: The Beneteau Oceanis 60 may be of interest to shoppers looking at this model. 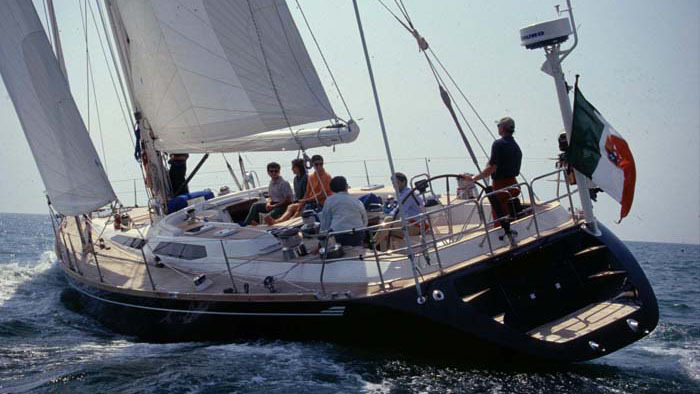 Those willing to spend a bit more might want to see the Oyster 625 or the Hylas 63. 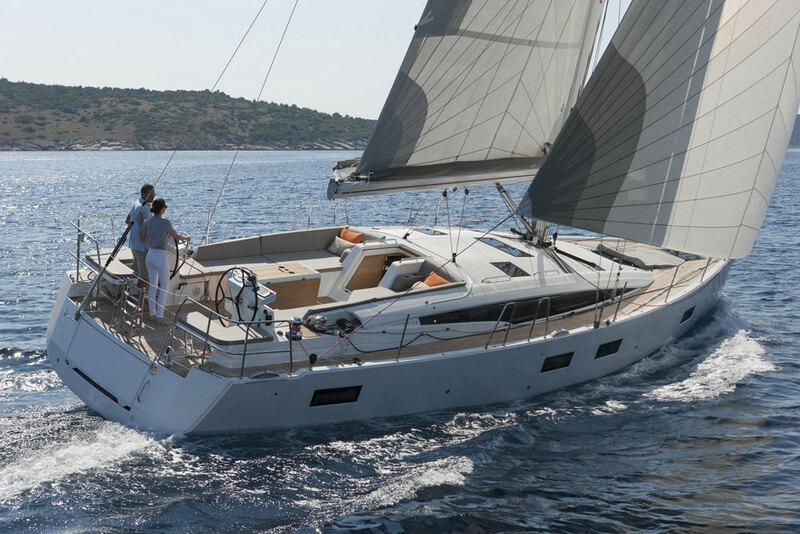 For more information visit Jeanneau. 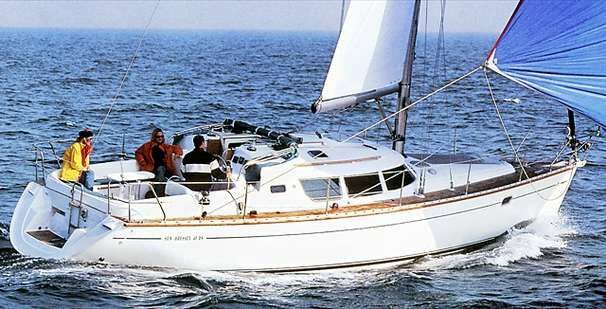 Or, see Jeanneau 64 listings.